Establishing an effective career development program starts at the planning stage by having a well-defined competency architecture or blueprint as well as career paths / streams and roles within job families. Fundamental to effective Competency-based Career Planning & Development are a competency library and competency architecture that allows employees and managers to compare and contrast competency requirements across roles and levels within or across job groups. 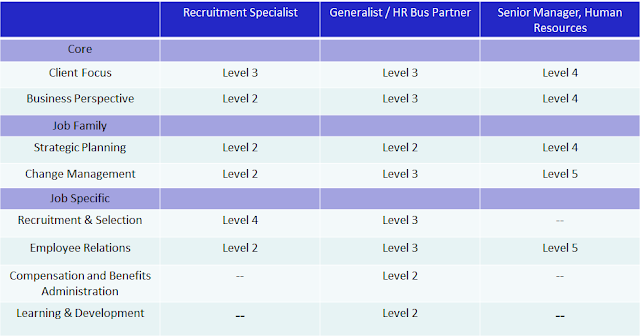 Having competencies available that are scaled according to proficiency levels, like the example shown in the previous blog, make the job of defining logical career paths and ladders within the organization that much easier. Both employees and the organization can see how jobs relate one to the other both in terms of the competencies and proficiency levels needed for successful job performance. Another construct that is helpful is that of the Job Family or Job Group. These are groups of jobs that tend to have common functions / duties and form a logical group for acquiring resources and managing careers (e.g., Finance; Sales; Information Technology; etc.). While career progression can occur in a variety of ways, generally speaking career development is typically planned and occurs within job families. Thus, it is more likely that people with an interest and training in a particular functional area will seek career opportunities within the job family as compared with other job families. Competency Profiles defined for typical roles within Job Families provide the foundation for determining potential career paths or streams. This allows both supervisors and employees to see how progression typically occurs. It also allows the organization to develop career development and succession management programs, tools and processes that support progression. 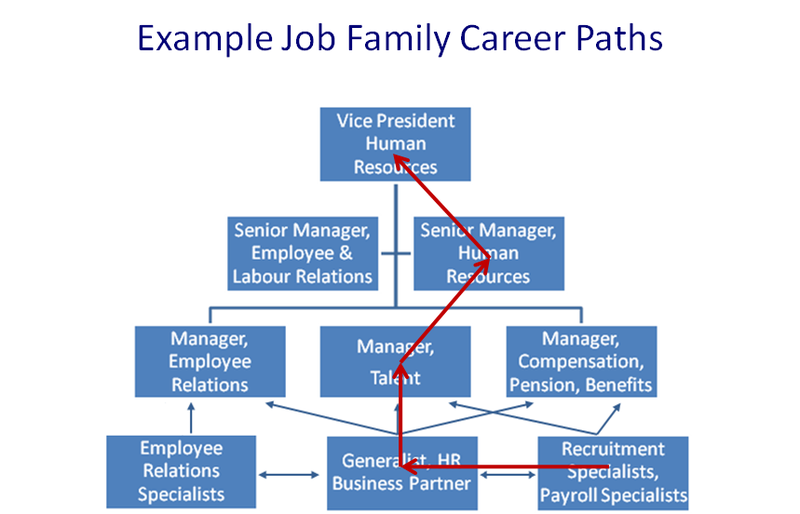 The following diagram shows illustrates how potential career streams within Human Resources could be laid out. In this example, there could be several different ways for advancing through the different areas and levels of HR to the Management and VP levels. This diagram along with sample competencies defined for three jobs / roles within the Job Family in the table below provide a foundation for employees to examine potential options for advancing their careers. As can be seen, a Recruitment & Selection Specialist role requires a higher level of proficiency in this specialty area than is required for the Generalist / HR Business Partner role. On the other hand, higher proficiency levels are needed for Business Perspective, Change Management and Employee Relations within the Generalist / HR Business Partner role. In this way, job roles can be compared and competency-based development plans, tools and programs can be put in place to address potential career moves within the organization. The next blog in this series provides more in-depth information on best practice tools and processes often used within Competency-based Career Planning & Development. Sign up to our blog’s mailing list through the form on the right-hand side to receive the rest of the series in your inbox.